First off I want to comment on just the whole idea of #the12Challenge. For the first month it has been wonderful. There really is something to be said about focusing on a couple of things for a short amount of time to not only practice but to develop a rhythm. Mentally it is so much easier to commit for a month than it is to commit for a year. What I have also found is that the practices I committed to for January have carried into February with ease. Secondly I have loved having a focus for my study each month. I often find myself overwhelmed by the number of things that I am interested in and want to study. I am perpetually curious and this can often lead to a paralysis as to where to start, which also often leads to guilt about which books I am reading versus which I am not. Challenge 1: 1500 Calories or Less per Day- With the help of the My Fitness Pal App, I was not only to track this well but I was also able to keep this commitment 22 of the 27 days of the month (I allowed 1 cheat day a week). This also led to me losing 4 lbs over the course of the month! Challenge 2: Some Sort of Physical Activity 5 Days a Week- I was able to do this 17 of the 22 days I tracked. The biggest thing I learned during this time was how much I love walking my dog around the neighborhood. It has been something that she and I have both looked forward in the afternoons. It has also allowed me to listen to podcasts in a different environment than my car which has been nice. It was a great adventure during the cold and rainy month of January to read about how some of the happiest people on earth live and live well in the winter months. I was especially intrigued with the practice of Hygge. This is a practice perfected by the Danes that focuses on warmth, fire, light, nature, family, friends, being together, and overall happiness. We were able to practice Hygge through the course of the month with our family and friends. There are several foods and practices that are associated with Hygge that we also delved into. 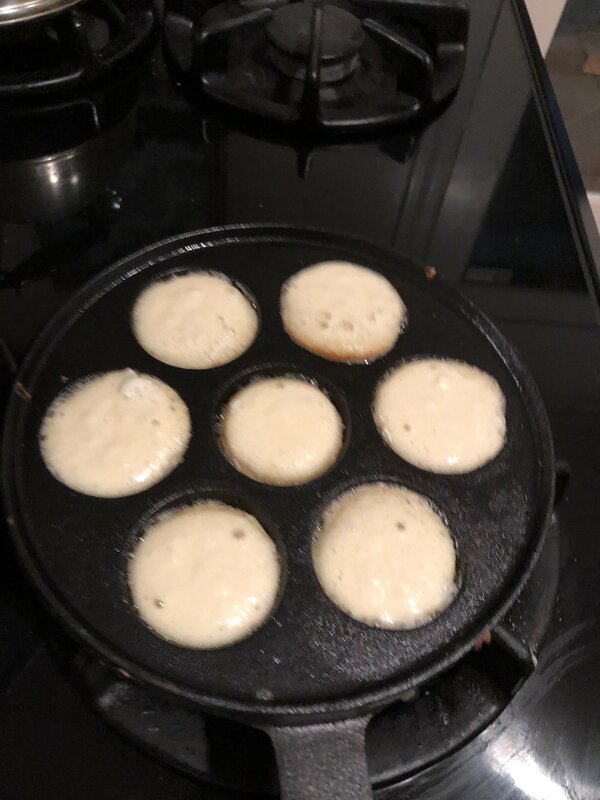 Aebleskivers- These are awesome pancake balls that are both tasty and bring a smile to your face. They require a special pan which can be purchased on Amazon for under $20. Glogg- This Danish treat has become my favorite version of mulled wine that I have come across to date. it is sweet, layered with a lot of spices and warms you from the inside out. I did the version with bourbon and it was well worth the effort. Sauna- The Sauna is a staple in Scandinavian countries especially in Finland. When we were there this Summer we spent a few hours in the Loyly Sauna in Helsinki which was recently names the happiest place on earth, we could not agree more :) I now go to the Sauna at my local gym where I work our and play racquetball. It is not as hot as the ones in Finland but does the job and has been an awesome weekly practice. I hope you will join with Bryant and I as we continue #the12Challenge for the month of February!